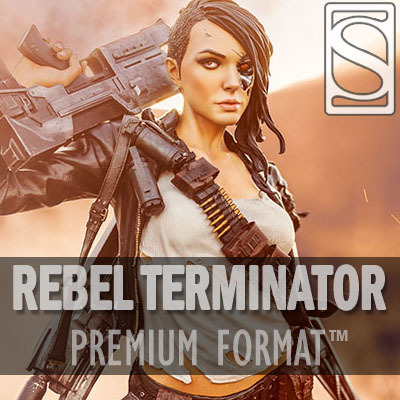 Sideshow is thrilled to present the Rebel Terminator - Mythos Premium Format™ Figure, a powerful new ally in the struggle against Skynet. As a collection, Sideshow’s Mythos series captures the limitless possibility of fan-favorite franchises by emphasizing core themes and introducing unique story details to popular fictional universes. The Rebel Terminator emerges as an exciting new figure whose story blends seamlessly into the mythology of the Terminator franchise, personifying the spirit of technology and resistance to spark the imagination of fans everywhere. The Rebel Terminator stands 19.5” tall on a cracked battlefield base littered with debris and decommissioned endoskeleton skulls. Battle damage from her deadly hunts reveals the renegade assassin’s own mechanical features- an exposed arm and piercing red eye tell the story of the Rebel Terminator’s mysterious past. The resin Rebel Terminator - Mythos Premium Format™ Figure features an incredibly detailed sculpted costume, consisting of a black jacket, white undershirt, green pants, and combat boots. Her rugged look is textured with tatters and tears to reflect the raging battle against the oppressive forces of Skynet. The Rebel Terminator shows no signs of slowing down in her directive, clutching a severed endo-skull in her mechanical hand. Already preparing to eliminate her next cybernetic target, she holds a 40-watt plasma rifle triumphantly over her shoulder. Another plasma rifle hangs at her back, amid a variety of tactical gear and pouches to protect her human façade from further destruction. “The Rebel Terminator serves as an ally to the resistance and a reminder to Skynet that the human spirit is not easily conquered by the machine,” the Kucharek brothers added.